President's Day is a gestalt entity found on Holiday Island in the episode Depth Takes a Holiday. 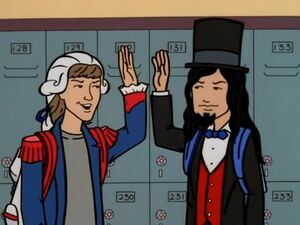 Unlike the other holidays, President's Day is represented by two teenagers, versions of George Washington and Abraham Lincoln, instead of one individual. (The Day was formed to celebrate the birthdays of both presidents.) Washington and Lincoln have independent minds and are usually referred to as individuals or as "the Presidents". President's Day takes charge of popularity at Holiday Island High School after Christmas, Halloween, and Guy Fawkes Day leave to form a band. (Thanksgiving was too distracted by family issues) They bully around the remaining holidays (like poor Arbor Day) with Veteran's Day as their henchman, leading Valentine's Day and St. Patrick's Day to seek outside help. Their reign ends when the missing holidays return and perform with their band, the Holidays, at the school dance, which encourages the students to stand up to President's day - the Holidays weren't going to do it but the idea of the Presidents running the place sickens them. After the performance, with the band needing an extra member (as Trent Lane is going back to his band), George Washington joins them as a harpsichord player. He can do electric and acoustic! "The War on Christmas" by Smijey reveals that when Lincoln and Washington's birthdays got merged, President's Day became representative of all presidents - including the sucky ones.